(Trent Nelson | The Salt Lake Tribune) Unified Fire recruits debrief after a live response to a vehicle and structure fire at the Unified Fire Authority Training Center in Magna on Tuesday April 16, 2019. 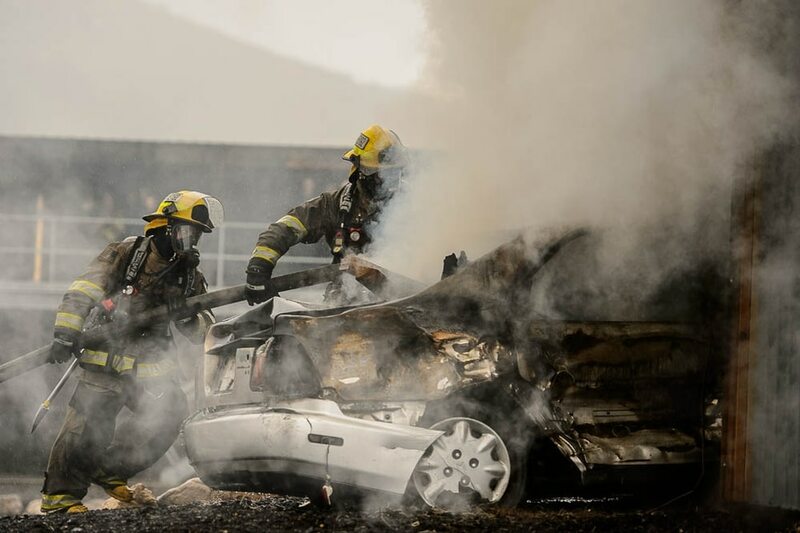 (Trent Nelson | The Salt Lake Tribune) Unified Fire recruits in a live response to a vehicle and structure fire at the Unified Fire Authority Training Center in Magna on Tuesday April 16, 2019. (Trent Nelson | The Salt Lake Tribune) Unified Fire recruits in a live response to a vehicle and structure fire at the Unified Fire Authority Training Center in Magna on Tuesday April 16, 2019. (Trent Nelson | The Salt Lake Tribune) Megan Fenton, a Unified Fire recruit, at the Unified Fire Authority Training Center in Magna on Tuesday April 16, 2019. (Trent Nelson | The Salt Lake Tribune) Unified Fire recruits in a live response to a vehicle and structure fire at the Unified Fire Authority Training Center in Magna on Tuesday April 16, 2019. (Trent Nelson | The Salt Lake Tribune) Unified Fire recruits in a live response to a vehicle and structure fire at the Unified Fire Authority Training Center in Magna on Tuesday April 16, 2019. (Trent Nelson | The Salt Lake Tribune) Unified Fire recruits in a live response to a vehicle and structure fire at the Unified Fire Authority Training Center in Magna on Tuesday April 16, 2019. 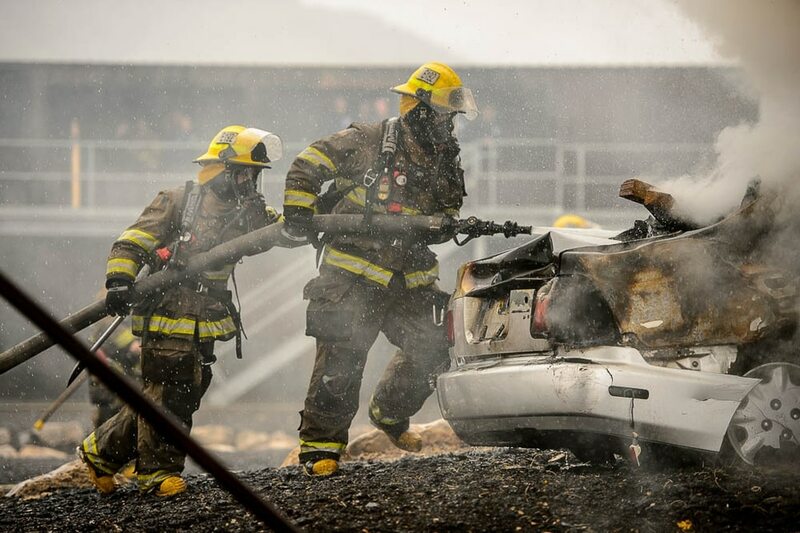 (Trent Nelson | The Salt Lake Tribune) Unified Fire recruits in a live response to a vehicle and structure fire at the Unified Fire Authority Training Center in Magna on Tuesday April 16, 2019. As white smoke billows out of a gray sedan, stuffed with wooden pallets and straw and pulled halfway inside a metal storage container, a crew of firefighting recruits pull up in fire engines to the makeshift scene. “Seems like we have a car fire that’s connected to a garage,” Unified Fire Authority recruit Megan Fenton explains. She and about a dozen recruits who aren’t putting out that training fire are watching to see how the rest of their class responds. The recruits ready fire hoses. Some attack the car fire. Some enter the “building” to attack from inside. Benton said her class of 27 recruits has tackled all sorts of simulated fires in their training so far, but they haven’t seen this exact scenario before. She said the trainers try to keep the classmates on their toes, since no two real-world fires are ever the same either. About 7 minutes after the blaze started, the recruits had extinguished it. 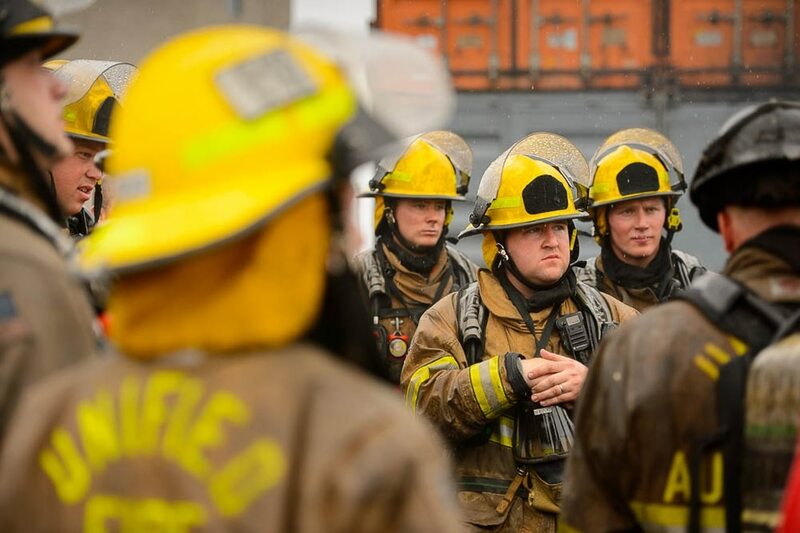 This class of recruits will finish training and begin probationary periods as full-fledged firefighters at the end of May, and that influx of firefighters will help with UFA’s hiring needs. But in order to keep up with demand, the fire department will need to hire 12 to 20 more firefighters every year. UFA recruitment numbers have dropped about 70% over the last ten years, while workloads have increased, especially in faster-growing cities, according to a news release from the department. Before this year, UFA hired a new class of recruits every two years, UFA spokesman Matthew McFarland said. But the department was losing many good candidates to other departments because of the long wait time between recruitment classes. Now the department is hiring a new batch every year. Recruitment begins in July. McFarland said it’s hard to know why fewer people want to be firefighters than in years past, but he suspects there are multiple reasons. Perhaps, he said, it’s because a younger generation of people want different things out of their jobs, preferring a technology-related role behind a desk to out-in-the-field, dirty work. Or they’re waiting longer to decide on a career, trying out multiple jobs before settling down. Whatever it might be, McFarland said firefighting is still a good option for a lot of people. Entry level firefighters can expect to make $44,233 a year, without considering overtime or other benefits, according to UFA’s website. Pay increases on a scale based on experience and rank. Firefighters typically work 48 consecutive hours, and then are off four days before starting the schedule over again. There’s also a pension, one of the best in the U.S., according to a May 2018 American Investment Council report. Benton said she decided to go into firefighting after trying out a job in the corporate field. She said some people might not consider the job because it’s difficult mentally and physically — but it’s also rewarding. Other than being a doctor, she said, in what other jobs do you get to regularly save lives? And as someone who played sports growing up and in college, Benton said she loves the team atmosphere of the job. UFA is Utah’s largest fire agency, serving nine cities and five townships in Salt Lake and Utah counties, in addition to the unincorporated areas of Salt Lake County, according to its website. For more information on becoming a UFA firefighter, visit unifiedfire.org and click on the “Employment” tab.